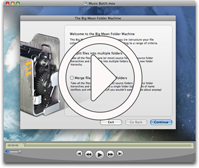 This trial version works on Mac OS X 10.7 Lion and later, and is limited to processing at most 100 files at a time. This trial version works on Mac OS X 10.6 Leopard, and is limited to processing at most 100 files at a time. This trial version works on Mac OS X 10.5 Leopard or later, and is limited to processing at most 100 files at a time. This trial version works on Mac OS X 10.4 Tiger and is limited to processing at most 100 files at a time.